A boleen is used strictly for cutting herbs. Courtesy Raymond Buckland/Fortean Picture Library. In Wicca, a boleen is a small knife with a curved blade used strictly for cutting herbs. 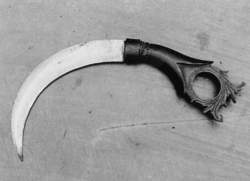 It is often confused with the White Handled Knife, which is a coven tool used for inscribing other Craft tools. The boleen is usually about six inches from the tip of the blade to the end of the handle. The handle has a round hole in its end, through which the thumb or little finger can be placed when holding it, for easier use. A popular wood for the handle is cherry.